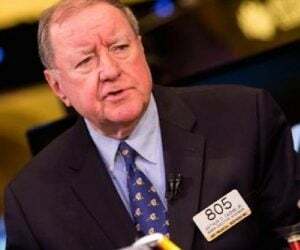 As the world edges closer to the next crisis, today the man who has become legendary for his predictions on QE and historic moves in currencies, told King World News that Russia, China and India are making historic moves ahead of the global reset. Egon von Greyerz continues: “The US has not had a real budget surplus for almost 60 years and has run balance of payment deficits every year since 1975. A country that lives above its means for over half a century is technically and economically bankrupt. Its debt should have zero value and so should its currency. But the US has skillfully avoided bankruptcy, so far, by having the reserve currency of the world and being the biggest military power. Both Russia and China can see the writing on the wall. They understand that the world’s most indebted country cannot solve its debt problem by issuing more debt. That is why Russia and China, together with India, are buying most of the global gold production every year. 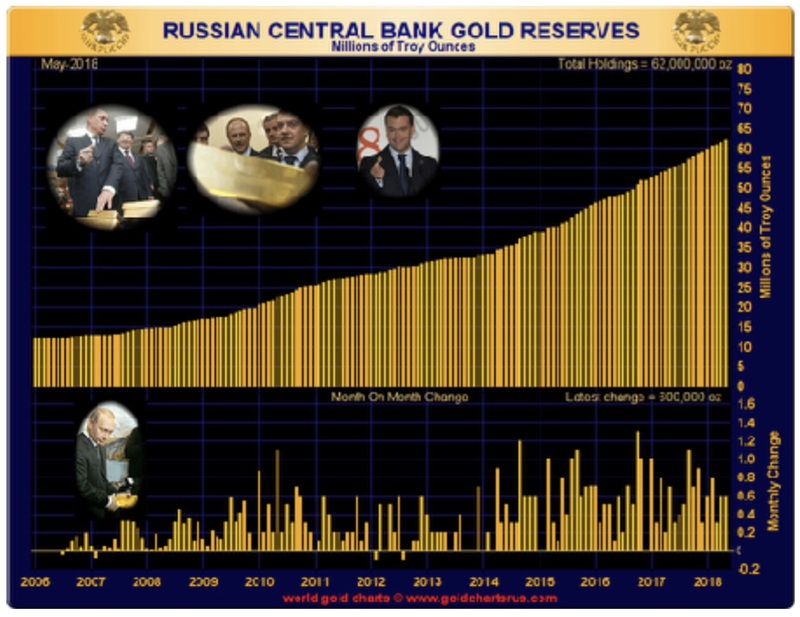 In May Russia added another 600,000 oz or almost 20 tonnes to its gold reserves. Since January 2018, when Trump became president, US debt has increased by 6% or $1.1 trillion to $21.1 trillion, while Russia has added another 9 million oz of gold, and are now holding $80 billion of gold reserves. So while the US economy is taking the road to perdition, Russia knows that the only money that will survive is gold — just like it always has! 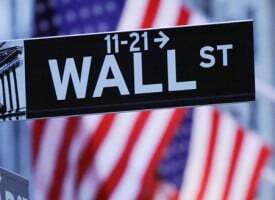 For years the world has financed the US debt by buying US treasuries. But we are now seeing a marked change. Many countries are currently liquidating US Treasuries. They know what will happen to US debt and are trying to get rid of their holdings in an orderly manner in order to avoid US Treasuries crashing together with the dollar. This is what will happen at some point in the next 1-3 years. 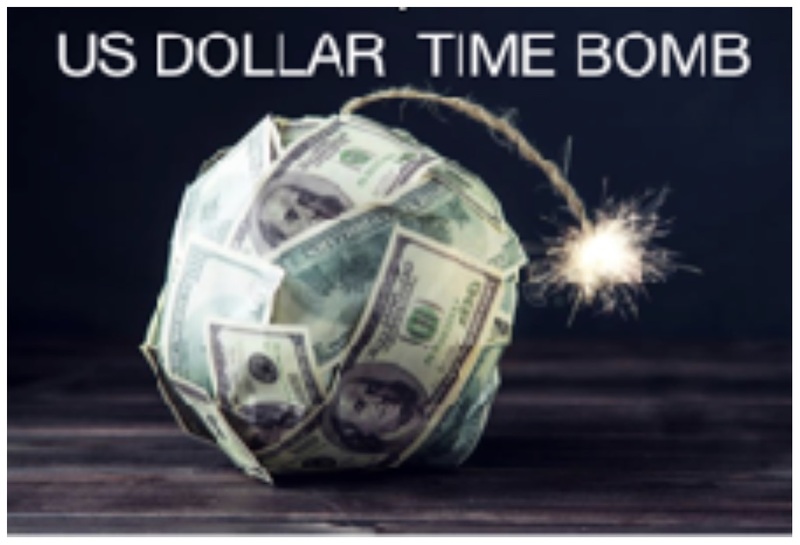 Global investors will panic out of dollar denominated bonds, leading to a crash of both the US currency and dollar debt. The Chinese know this but their US Treasury holdings are so large that they need to sell slowly in order not to shoot themselves in the foot. In the end, China is likely to take a major loss on its dollar Treasury holdings but that is the price they have been willing to pay in order to build up their economy and manufacturing sector through financing US deficit spending. Simultaneously, China has invested heavily in the resource sector in most parts of the world. China understands that commodities are massively undervalued compared to the bubble asset markets. 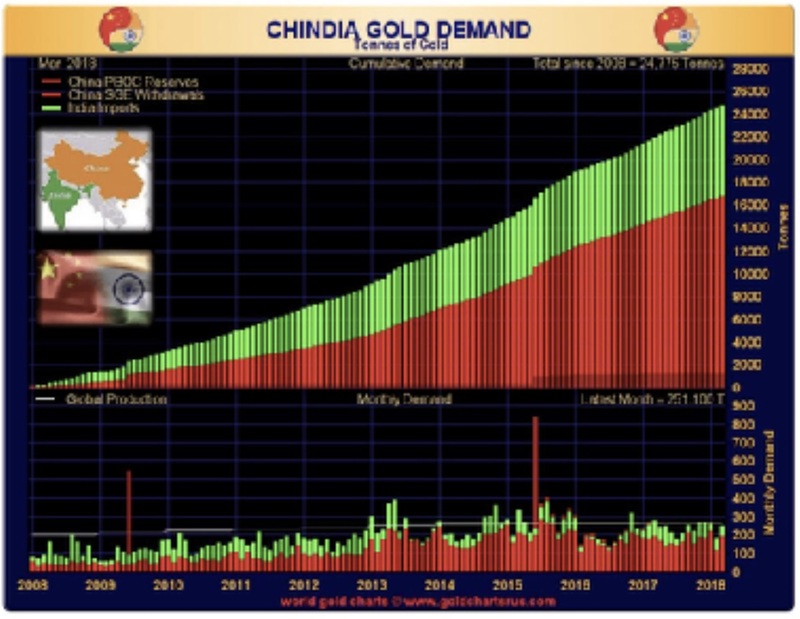 At the same time, China has continued to buy a major percentage of annual gold mine production since 2008, taking total Chinese purchases to 16,000 tonnes. 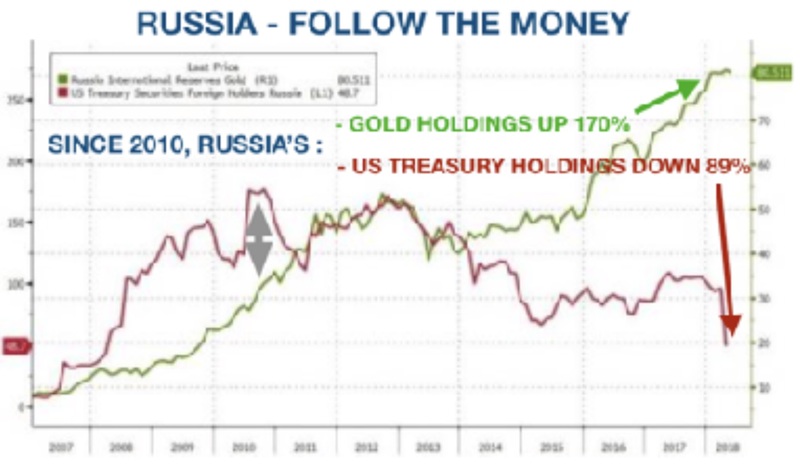 For anyone who wants to Follow the Money, just look at the chart below how Russia is dumping US Treasuries and adding to its gold reserves every month. Because Russia knows that gold will surge and US Treasuries will crash. From insignificant gold holdings in 2007, today Russia has $80 billion of gold. And since 2010, Russia’s US Treasury holdings have gone down by 89% to $20 billion today. Many investors are holding US Treasuries as a flight to safety. Well, I certainly agree with the Russians and the Chinese. 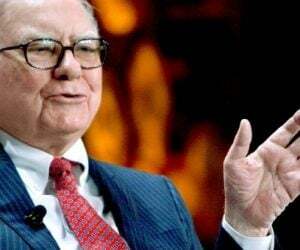 It must be one of the riskiest investments you can hold today and is as far from wealth preservation as you can ever get. 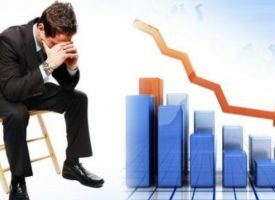 The dollar will go to zero – it is already down 98% since 1913 – and US Treasuries will go to zero as the world realizes that US debt can never be repaid with real money. 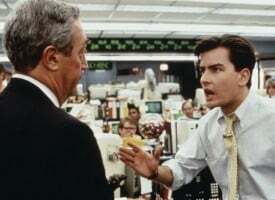 So investors in US Treasuries can expect the most momentous double-whammy. Whatever they don’t lose on the dollar going to zero, they will definitively lose on US debt instruments. This means that US treasury debt, over $21 trillion and growing, will explode or more accurately implode. What is the best currency to hold your assets in? This is a question I often get asked. The answer is really so easy but still most people never see the obvious. If something has declined by 97% or more, is it going to stop there? Not likely! 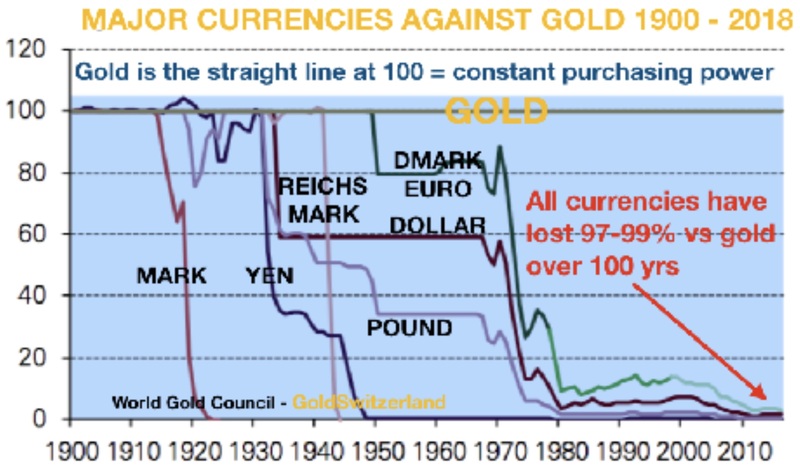 All currencies have lost 97-99% in the last 100 years, so it is extremely likely that they will lose the remaining 1-3%. Therefore why try to pick the best of a useless lot when they will all lose all their value. There is only one currency that stands the test of time, which is of course gold. It is the only money that has survived in history. 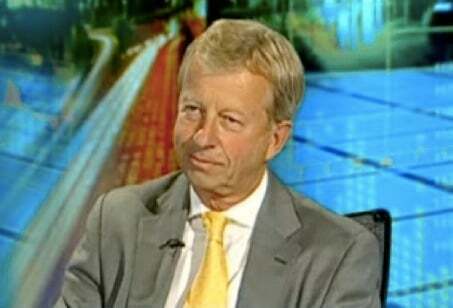 With a 5,000 year success rate, why bet against gold? Gold is the only money to hold from now on until the financial system has been reset or has imploded. One thing is certain, there will be no orderly reset. 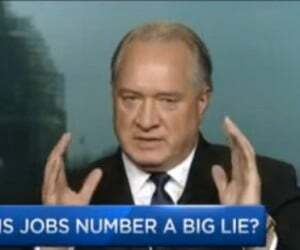 No central bank or government hocus pocus can ever make $2 quadrillion of debt and liabilities (25x global GDP) disappear by waving a magic wand. Egon von Greyerz continues: “By holding cash in a bank in whatever currency, it will either become worthless due to endless money printing, or the banks will lose it all in their futile attempts to repay all depositors their money which has been lent out 10 to 20 times. Most banks have fraudulently accepted depositors money, knowing that they would never be able to repay it. This crazy Ponzi scheme works as long as the world believes that printed money is real money. But when the music stops, everyone will realize that it wasn’t money at all but pieces of paper or electronic entries that everybody called money. At that point fiat money will have zero value and few people will understand that dollars, euros, yen, etc, in the 100’s of trillions can just go up in smoke without any trace. Much better to hold an asset like gold which is no one else’s liability and which has zero counterparty risk, as long as it is held in physical form and outside the banking system. 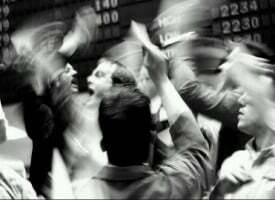 The manipulators dumped 30% of annual goldmine production in a few hours last week. We are seeing real interest from higher end investors in owning physical gold for wealth preservation purposes. 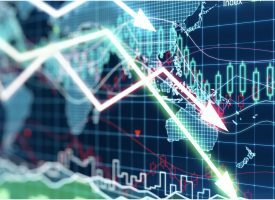 The risks in the world economy and the financial system are so major that any minor catalyst can burst the biggest bubble in history in a millisecond. Current prices of gold and silver represent an excellent opportunity to move investments out of all the overvalued bubble markets and out of risky fiat money into the best insurance and investment that paper money can buy today. 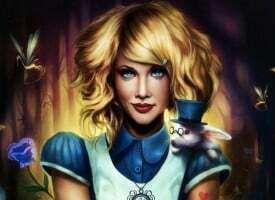 This is a historical opportunity to move wealth out of an extremely fragile house of cards to the most solid wealth protection asset that paper money can buy.” For those who would like to reach out directly to Egon von Greyerz and the people at GoldSwitzerland to learn more about how you can protect yourselves and your family CLICK HERE. The KWN audio interview with Dr. Stephen Leeb discussing China’s 20,000 tonnes of gold and their plans for a gold monetary order has now been released and you can listen to it by CLICKING HERE OR ON THE IMAGE BELOW. Gerald Celente Just Issued This Major Trend Alert!